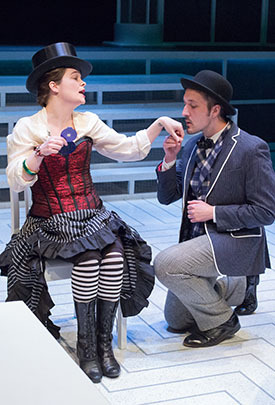 Pictured: Charlotte Northeast and Adam Hammet in Measure for Measure (2019). Photo: Mark Garvin. Header Photo: Bi Jean Ngo in 36 Views (2016); Kittson O'Neill, Maxwell Eddy, and Alex Boyle in Arcadia (2014); Damon Bonetti, Daniel Fredrick, and Dave Johnson in The Hound of the Baskervilles (2015); and Kirk Wendell Brown and Peter DeLaurier in The Train Driver (2014). Photos by Mark Garvin.